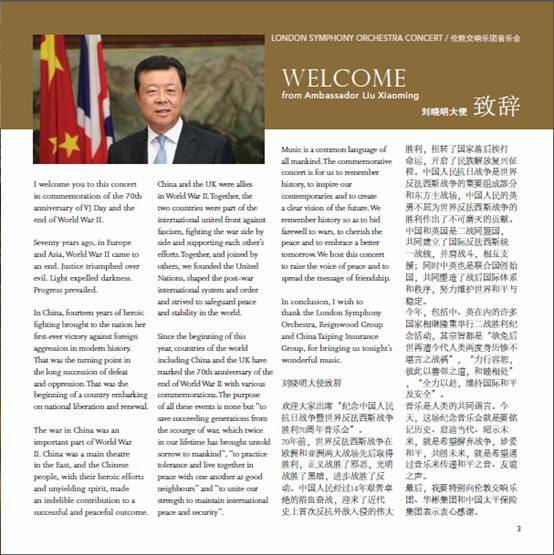 I welcome you to this concert in commemoration of the 70th anniversary of the Victory of the Chinese People's War against Japanese Aggression and the World Anti-Fascist War. Seventy years ago, in Europe and Asia, World War II came to an end. Justice triumphed over evil. Light expelled darkness. Progress prevailed. In China, fourteen years of heroic fighting brought to the nation her first-ever victory against foreign aggression in modern history. That was the turning point in the long succession of defeat and oppression. That was the beginning of a country embarking on national liberation and renewal. The war in China was an important part of the World Anti-Fascist War. China was a main theatre in the East, and the Chinese people, with their heroic efforts and unyielding spirit, made an indelible contribution to a successful and peaceful outcome. China and the UK were allies in World War II. Together, the two countries were part of the international united front against fascism, fighting the war side by side and supporting each other's efforts. Together, and joined by others, we founded the United Nations, shaped the post-war international system and order and strived to safeguard peace and stability in the world. 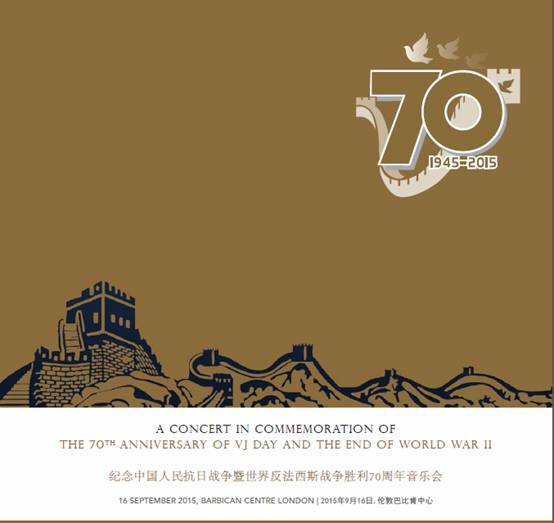 Since the beginning of this year, countries of the world including China and the UK have marked the 70th anniversary of the end of World War II with various commemorations. The purpose of all these events is none but "to save succeeding generations from the scourge of war, which twice in our lifetime has brought untold sorrow to mankind", "to practice tolerance and live together in peace with one another as good neighbours" and "to unite our strength to maintain international peace and security". Music is a common language of all mankind. The commemorative concert is for us to remember history, to inspire our contemporaries and to create a clear vision of the future. We remember history so as to bid farewell to wars, to cherish the peace and to embrace a better tomorrow. We host this concert to raise the voice of peace and to spread the message of friendship. In conclusion, I wish to thank the London Symphony Orchestra, Reignwood Group and China Taiping Insurance Group for bringing us tonight's wonderful music.